For all of those who have troubles holding onto your sticks during a show do not worry, there is a solution! 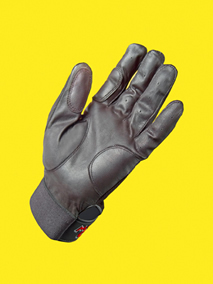 Introducing the Might Grip Drummers Glove. This black glove is said to increase your grip when holding the drum sticks. But does it work as well as it claims to? A lot of skeptics will say that wearing gloves will slow down your playing and cause you sweat. Mighty Grip has a few unique designs that fight these speculations. Besides, these guys make gloves for practically every use; they must know what they are doing. The Might Grip gloves actually looked very slick. They are black, (which can match everything) with slick designs all over them. They have extra padding on the parts where the stick usually rubs the most. This is very nice to have, as it will save your self from unwanted blisters. There are Velcro straps that secure the glove on tight. On this strap there is the Mighty Grip Logo on it. This is a little colorful and can be a bit distracting to some; however, I was a fan of the design. Through out the gloves are holes that allow your hand to breath. This prevents over heating. The back hand part of the glove is done in a flexible fabric that breathes very well also. All in all, the look is slick and comfortable. The Might Grip gloves promise a mighty grip, but does it deliver? Well, at first I picked up the stick and was supposed in how well it felt. The texture of the gloves gives an extra edge in stick grip. So all in all, the gloves delivered. Compared to bare hands, the Mighty Grip gloves offered a lot more grip. The longer I played, the more grip I seemed to have. This is totally different then playing with nothing at all. The pads on the gloves allowed me to play harder than ever, not having to worry at all about blisters or anything like that. As for the sweat – yah there was some. This cannot be avoided, since you are moving your hands fast with something covering them. It wasn’t as bad as I thought it would be, and with the vent holes I was easily able to put up with it. The biggest thing you want to do is make sure you have the right size for yourself. The biggest disadvantage I found to these gloves was movability. I found I couldn’t use my fingers as much as I used to be able to do. For example, playing the French grip was very tricky. If you have gloves too tight, you will find it hard to move the sticks through your fingers very easy. If you get gloves to big, you will have problems with the sticks hitting the excess gloves hanging off your fingertips. If you get a perfect fit, the gloves will slide on quiet snug, and feel right. It may take you a few uses to wear the gloves in, and you may not be used to it at first. Give it a week and you will want to wear them all the time. Plus, they look cool right? The mighty Grip Gloves can be purchased on their web site for only $19.95, which is a very good price if you think about what it can do for you. Do not buy this as a solution to falling sticks, but rather as an addition to your skills. Dropping sticks is usually a result of poor hand technique. The Mighty Grip will help, but only so much, make sure you are using proper stick grip! If you are looking for a bit of extra support, and a cool new look, then the Mighty Grip Gloves are just what you need! RTOM Moongel Workout Pad - Looking to improve your chops? Many drummers rely on the use of a practice pad to work on rudiments and hand speed when they are away from the kit. Unfortunately, most practice pads only emulate the feel of a snare drum, giving too much bounce to emulate a rack or floor tom. RTOM has developed a product that solves this problem. Their "Workout Pad" offers very little bounce, and feels much more like a floor tom than a snare drum.